Cassandra Sandsmark was born out of wedlock and raised by her single mother, Helena. Because of the circumstances of Cassie's birth, and the fact that Helena's family disowned them both, her mother can prove a bit overprotective at times. After all, Cassie is all the family she has left. Although Cassie is athletically inclined, her intelligence and glasses make her a bit self-conscious, giving her a bit of a "geek complex." And like many kids with such an outlook, Cassie lived a rich fantasy life, topped off by a strong adoration of super-heroes. Meeting Wonder Woman was the crowning moment in her life, and one that would change her forever. While Diana of Themyscira was interviewing at Helena's museum for a job as a lecturer, Cassie accidentally activated an ancient Greek robot that began pursuing her. It was Wonder Woman who saved her. Later, Cassie experienced the power of flight when Diana briefly lent her the Sandals of Hermes. 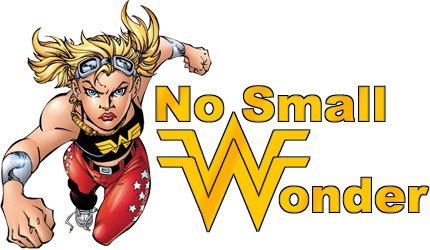 On two occasions, Cassie "borrowed" the sandals, as well as the Gauntlets of Atlas, and donned a makeshift costume to aid Wonder Woman in battle. Then, when the ancient Greek gods were trying to decide whether to return to earth, Diana summoned Cassie to Olympus, and the gods probed her mind for information. While there, the girl requested an audience with Zeus, not knowing at the time that he was her long-absentee father, and got a chance to speak to the god. Impressed by his daughter's courage at approaching him, Zeus granted her heart's desire, a set of powers similar to Diana's own. 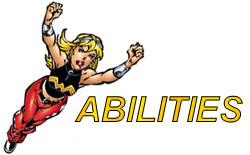 At Wonder Woman's behest, the Amazon Artemis and Donna Troy, the original Wonder Girl, began training Cassie in the proper use of her powers. 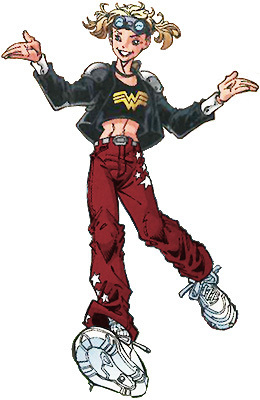 Cassie made herself a costume similar to that of Superboy, who she has a huge crush on, and joined the Young Justice team with Robin, Secret, Impulse, and Superboy himself. Other members of the team have included Arrowette, Empress, Slo-bo, the Ray, and, briefly, Lagoon Boy. With the disolution of Young Justice after the Graduation Day debacle, Cassie retired. 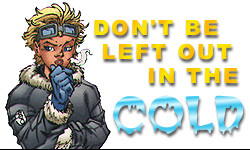 When Cyborg rebuilt the Teen Titans, Cassie reluctantly joined. She made herself a new costume in tribute to Donna Troy who was, at the time, believed dead. Since joining the Teen Titans, Cassie has been given her own lasso, one that deals pain equal to Cassie's ire, by her half-brother Ares. She has also discovered the identity of her father. She is also involved in a more serious relationship with Kon-El... Superboy. 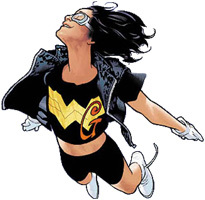 Her first two times out, Cassie used the Sandals of Hermes and the Gauntlets of Atlas to gain powers similar to Wonder Woman. Zeus granted her the power of flight and superhuman strength. Although she is not invulnerable, she also possesses near-superhuman stamina which allows her to take a lot of punishment compared to a normal teenage girl. Seeing the potential for abuse, however, and wanting Cassie to grow up with the proper respect for her mother, Zeus limited Cassie such that her mother can remove or restore her powers with a touch. Although her mother does not completely approve of Cassie's adventuring life, she has decided to allow her to make her own decisions and retain her abilities.